The ETC Pask Permeameter is constant head well permeameter designed and manufactured by Dynamic Monitors. It can be used to determine the field saturated hydraulic conductivity (Kfs) or the T time or percolation time (perc time) of soil or other porous media. Although the instrument has some limitations compared to more expensive alternatives such as the Guelph Permeameter, the Amoozemeter, and the Johnson Permeameter, most users find it is suitable for their routine testing requirements at a fraction of the cost of other options. Several customers have found that the unique design and lightweight construction of our ETC Pask Permeameter saves time in the field, and allows the completion of more permeability tests in less time compared to other constant head permeameters. It is definitely much faster than the percolation test. The table below contrasts the ETC Pask Permeameter to the Guelph Permeameter on twenty different points of comparison. Please feel free to contact us if you have any questions! Download the PDF version of this table here. Used to determine: Field saturated hydraulic conductivity (Kfs) of in situ soil, also prepared fill materials and constructed soil liners. Field saturated hydraulic conductivity (Kfs) of in situ soil, also prepared fill materials and constructed soil liners. Applicable soil textures/types: Virtually any soil type – USDA/CSSC: clay to sand. USCS: Sand, silty sand, silt and clay. Virtually any soil type – USDA/CSSC: clay to sand. USCS: Sand, silty sand, silt and clay. Time to set-up, fill and tear down Permeameter: Approx. 2 min – See video below. Approx. 7 min – See video below. Time to conduct a test: Most tests on medium permeability soils take 20-45 min. Tests on very slowly permeable soils (clays) can take several hours. Most tests on medium permeability soils take 20-45 min. Tests on very slowly permeable soils (clays) can take several hours. Guidance information on relationship to percolation tests? Yes. A new relationship correlating Kfs to Perc Time is provided based on the 2015 peer reviewed paper by Reynolds et al. Formulas and a quick conversion table are included in the guide. User guide states: “Approximate relationship is available upon request”. Are quick field calculation tables provided? Yes, for the four (4) major soil capillarity category types described by Reynolds (2008). No. Math skills required to conduct tests and obtain Kfs results: Basic. With our Field Quick Reference Tables you can determine Kfs in 10 seconds or less. Above average (College or University). Must calculate Kfs from formulas, or using the Guelph Permeameter Calculator spreadsheet. Method for testing imported fill materials used in septic beds? Guidance provided based on method recommended in CAN CSA B65-12 standard. No method or guidance provided. Single or double ponded head method? Single ponded head method. Single or double ponded head methods. Maximum operating/testing depth below soil surface: 60cm (24inches). If testing to a greater depth is required, excess soil can first be removed with a hand shovel or excavating machine. Custom models provided on request. 75cm (30 inches). If testing to a greater depth is required, remove excess soil or purchase extension tubes. Maximum practical recommended depth is 3.15m (10ft). Ability to test very soft soils with low bearing capacity? Not recommended without supporting the permeameter, otherwise, it may sink into the soil during the test. Yes, the tripod will support the permeameter and prevent sinking, unless the tripod legs themselves are standing on very soft soil. Height of water in well: Standard fixed height of 15cm (6″). This is a good height for most soil conditions and applications. Can be supplied with alternative well heights if desired. Adjustable between 2.5cm to 25cm. Well hole diameter: Approx. 8.3cm (3 1/4 in) if using auger supplied with our kit. May be used with alternative auger/well hole diameters. Approx. 6cm (2 3/8 in) based on cutting diameter of auger supplied with kit. Note*- ETC does not recommend use of a sizing auger as it can cause soil smearing (Lilly, 1991). 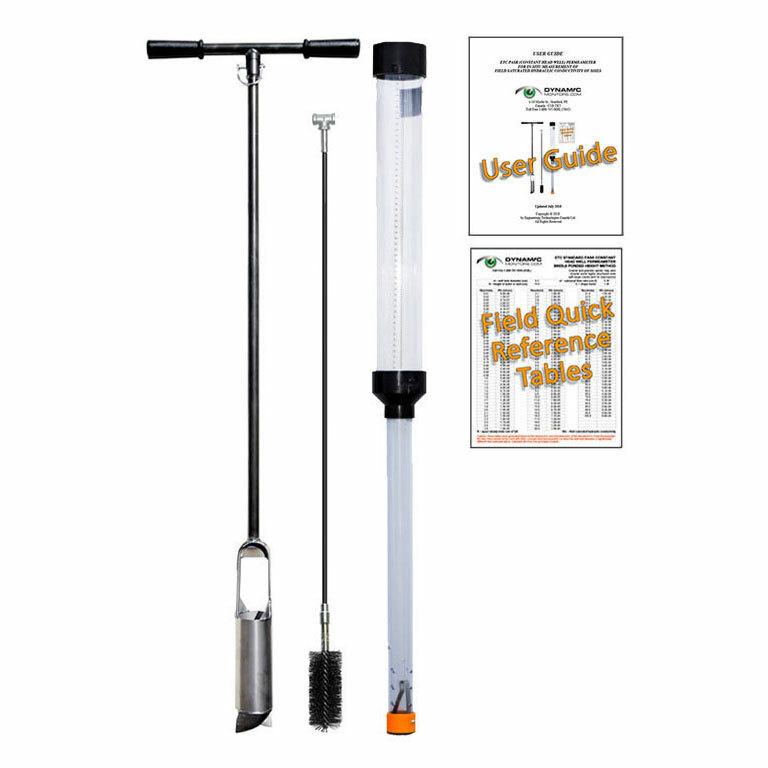 Pask Permeameter with custom ABS cap and stainless steel clip, AMS Riverside auger, wire well prep brush, user guide, quick reference field calculation tables. Guelph Permeameter, water container & tube, support kit, Riverside auger, sizing auger* (see note), tripod, well prep brush, vacuum test hand pump, carrying case, user guide. The following video compares the set-up, fill and tear-down time for the ETC Pask Permeameter versus the Guelph Permeameter. The ETC Pask Permeameter was 3.5 times faster to set-up and tear-down than the Guelph permeameter! All web site content © Copyright 2018 Dynamic Monitors. No part may be reproduced without written permission of Dynamic Monitors.